Nottinghamshire and England left-arm spinner Kirstie Gordon says the experience of making her England debut - and playing in the ICC World T20 final - has yet to sink in. Gordon was one of three uncapped players in England’s squad but played every match, taking eight wickets at an average of just 12.25 and an economy rate of 5.15, earning her a spot in the team of the tournament alongside Anya Shrubsole and Amy Jones. At just 21 years of age, it has been a baptism of fire on the international scene for Gordon, but one that left her wanting more. “What has happened in the last six weeks hasn’t really hit me yet,” she said. “A whirlwind is the best way to describe it, it’s been an incredible experience. “Obviously it was a really tough day on Saturday to not get across the line and get the trophy, but the journey has been amazing. “From the build-up in Loughborough, to finding out I was going and the pre-competition in Antigua, the journey has been great and the girls have been the biggest part of that. “Being a newbie I didn’t know how I was going to fit in, but everyone has made it really easy for me and the two other girls, Sophia (Dunkely) and Linsey (Smith). “Making the team of the tournament was very exciting and the icing on the cake of the whole trip. It’s something I would have never expected. 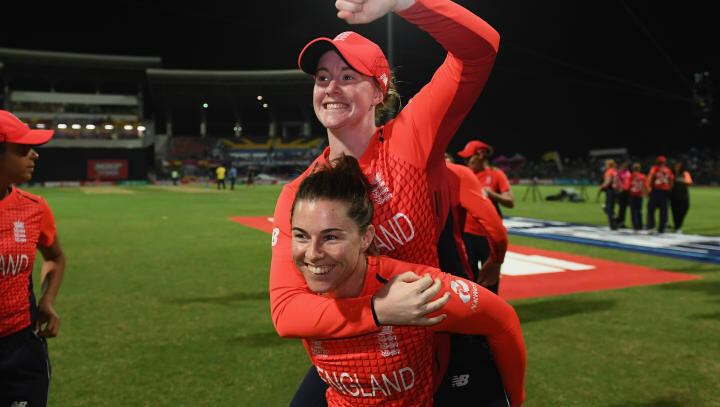 Matches came thick and fast in the World T20, as England beat Bangladesh, South Africa and India on their way to the final, where they fell short against Australia. The schedule itself, together with the leadership of Heather Knight, are two factors to which Gordon attributes her ability to stay calm in pressure situations. “With matches coming as quickly as they did, it helped me keep my feet on the ground and allowed me to focus on doing my thing day in and day out,” said Gordon. “Heather is fantastic and so calm under any sort of pressure. “She puts the ball in your hand and says ‘you have done it before and you can do it again’ which is really settling. “To have somebody next to you like that when you are about to bowl your first ever ball for England, or in the final of a World Cup, makes a massive difference. “I went over to the West Indies without any expectations. I didn’t know if I was going to be in the starting eleven and I could feesibly have not played a single game. For now, it’s back to iuniversity and the final year of a Sports Science and Management course, but cricket will not be far from Gordon’s agenda, having been named as part of the National Women’s Academy for the first time. “I’m back at Loughborough now with a few weeks of getting deadlines done,” she said.